Home › Brexit › Is Ireland a Legitimate Country? Lemass committed Ireland’s future to one of sovereign compromise. He had no choice. The international system is a complex and convoluted thing, and sets the framework against which States are measured for their effectiveness, righteousness, or other measures that could serve as proxies for legitimacy: transparency, robustness, even happiness, or goodness. According to these indices, Ireland performs reasonably well – very well actually. It is the seventh most ‘unfragile’ country in the world; the eleventh most ‘good’; the 18th most transparent; and the 19th happiest. Most of these indices combine different metrics such as GDP, social metrics like unemployment, education rates, and so on, which tend to mean that Ireland – and other countries – won’t deviate too much from one ranking to the next. So Ireland performs well as a country. However, the combination of the EU Crisis, Brexit, and Trump’s America seem to represent a trifecta of bad things over which Ireland has little or no control, and could send the country hurtling down those indices. So if Ireland has so little control over these shaping factors, is Ireland in fact a legitimate country, a genuinely sovereign power? These three factors – Europe, Britain and America – have long bounded the aspirations of Ireland, and events in these places have shaped the country’s history, just as Irish politicians have sounght leverage in one to counter challenges with another. England’s difficulty is Ireland’s opportunity went the mantra during the struggle for Independence. Republican leaders regularly exploited the distance between Ireland and America to build sympathy for the oppressed in the old country, playing to misty-eyed nostalgia at well lubricated fundraisers. Mary Harney, then Tánaiste and leader of the Progressive Democrats in Bertie Ahern’s first coalition government, in 2000 pondered whether the Irish spirit was closer to Boston or Berlin. Considering the European social model, American liberalism, and the British oscillation between the two, successive Irish governments have plotted strategic courses to optimise these three key relationships. Today, all three are in crisis, and Ireland’s position is exposed. The friends of the country remain friends, but are, well, busy. While the economy is stable, debt levels remain enormously high, and slight dis-improvements in growth could have significant current account implications. The British are consumed with their vote to leave the European Union. The Europeans for their part – and to the great chagrin of the British – are more concerned with structural weaknesses within the Euro, and threats from a resurgent Russia in the east, than they are with British identity politics. And the Americans, are more concerned with the tweets of a borderline sociopath in the White House than they are with anything else, anywhere. To put it mildy, the concerns of Ireland are insignificant. Should America impose new export / import duties, it could have immediate growth impacts on Ireland’s economy, which has foreign direct investment at the core of its strategy. Should the European Union force tighter tax harmonization rules, corporation tax rates could come under pressure, further pressuring the fiscal position. Should Britain resign from the Human Rights instruments of the European Union, the Good Friday Agreement – an International Treaty registered with the UN in Geneva – will be effectively rendered invalid and will require renegotiation, undermining the constitutional position of the Irish State. These three scenarios Irish diplomats are working feverishly to avoid. The international system is what it is. 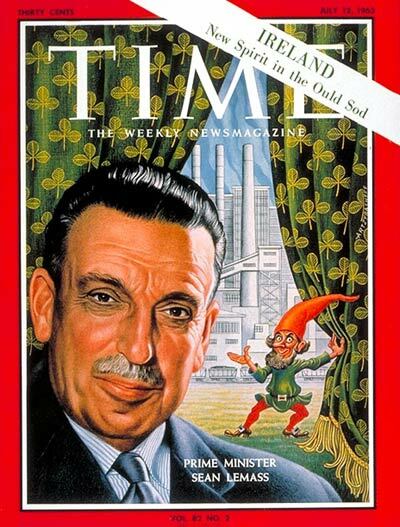 In the 1960’s, Sean Lemass steered the country through to relinquishing part of its sovereignty in committing to the European Economic Community. He knew then what it meant. Successive governments have further invested in this relationship, and yet when its need was most significant, the fundamental principles of solidarity which had underpinned the European project evaporated in favour of centralised self-preservation. The periphery could be sacrificed, it seemed, to nourish the heart. The British Secretary of State for Northern Ireland is more concerned with the train services in his home constituency of Old Bexley & Sidcup, and the political machinations of Westminster than he is with the collapsed government in the North, judging from his twitter account. And Donald Trump – well, good luck with that. So if Ireland’s political energies are so divided in triplicate between Brussels, London and Washington, and events in Dublin seem to carry on oblivious to domestic affairs, is Ireland in any sense sovereign? And should we conclude that its sovereignty is so denuded by external entanglements, is it legitimate at all? Whatever the answer, I think the question is most certainly a valid one.